Kangite (IMA 2011-092), (Sc,Ti,Al,Zr,Mg,Ca,□)2O3, is a new scandia, occurring as micro-sized crystals with REE-rich perovskite and spinel in a davisite-dominant ultra-refractory inclusion from the Allende CV3 carbonaceous chondrite. The phase was characterized by SEM, EBSD, synchrotron micro-diffraction, micro-Raman and EPMA. The mean chemical composition of the type kangite is (wt%) TiO2 36.21, Sc2O3 26.35, ZrO2 11.80, Al2O3 7.79, Y2O3 5.07, CaO 4.01, MgO 3.15, Dy2O3 1.79, V2O3 1.29, SiO2 1.10, Er2O3 1.07, Gd2O3 0.65, FeO 0.58, Cr2O3 0.07, sum 100.95 with a corresponding empirical formula calculated on the basis of 3 O atoms of [(Sc0.52Al0.21Y0.06V0.02Gd0.01Dy0.01Er0.01)3+Σ0.84(Ti0.61Zr0.13Si0.03)4+Σ0.77(Mg0.11Ca0.10Fe0.01)2+Σ0.22□0.19]Σ2.00O3. Synchrotron micro-Laue diffraction (i.e., an energy scan by a high flux X-ray monochromatic beam) on one type domain at sub-micrometer resolution revealed that kangite has a cation deficient Ia3‾ cubic structure. The cell parameters are a = 9.842(1) Å, V = 953.3(1) Å3, Z = 16 and a calculated density of 3.805 g/cm3. Kangite is a new ultra-refractory mineral, likely originating through low temperature oxidation of a Sc-, Ti3+-enriched condensate oxide dating to the birth of the solar system. 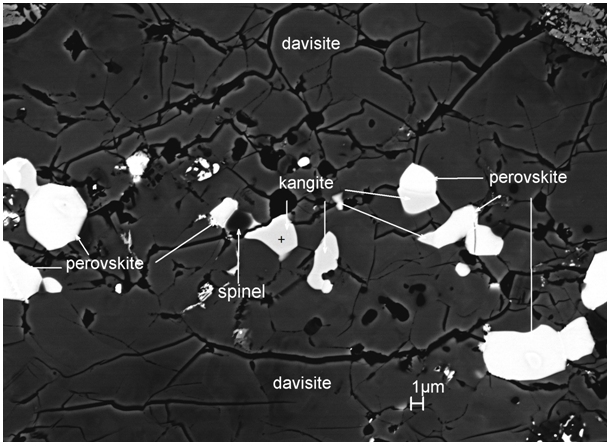 Back scattered electron image of two kangite crystals in davisite (CaScAlSiO6) associated with perovskite and spinel.